Does this look familiar? 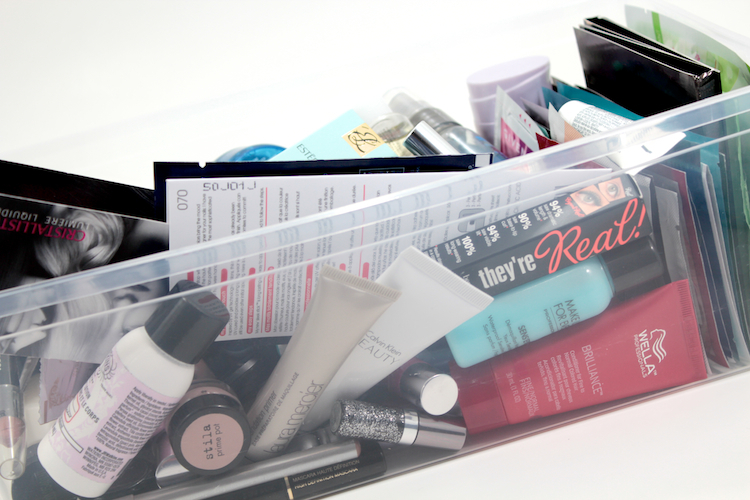 Who else has a container (or containers) filled with samples? Either from various beauty boxes, gift with purchases, beauty insider perks... they can really pile up, can't they? That's where Project Sample Pan comes in. A little variation from Project 10 Pan -- instead of using up 10 full-size products, I'm making it my mission to use up as many samples as I can. I've been casually doing this anyway, but I figured I should step it up. 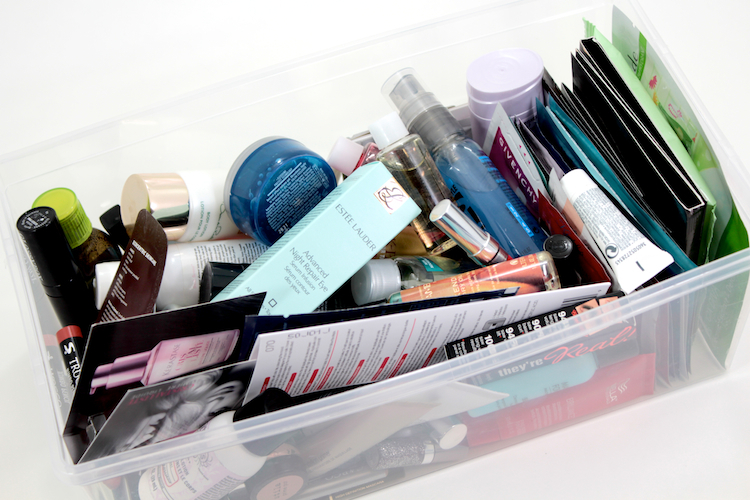 Some of the samples here have outlived the companies they came from, and some are from my very first beauty box (which was a Luxe Box, btw). So, I keep my collection of samples in these clear shoe boxes. I like being able to see inside them, that way, I know what I have (and what I need to use up). 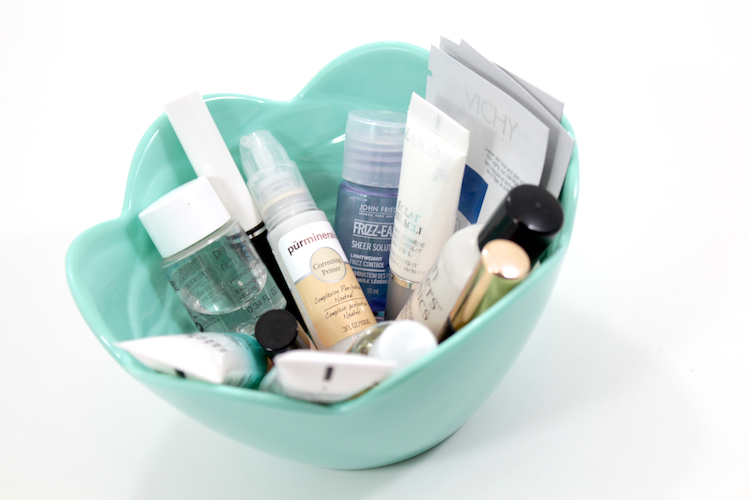 There's no rhyme or reason to the organization -- just two completely full containers of a hodgepodge of products. Every once in a while, I randomly grab a few products to store on my vanity for use. I keep the samples I'm planning to use up in a cute bowl that I picked up from Target. I adore the colour & the fun floral design. that is a TON of samples. I actually prefer samples over full sized products because full sizes take me a lifetime to complete! that is such a cute idea, I need to do this! I could probably discover so many cool products! I used to store my samples in an old Glossybox...then two old Glossyboxes. I'm moving overseas soon and did a pretty massive cull, and I've actually been using up quite a few samples because I've been bouncing around living situations lately and it's handy to have tiny things that don't take up much space. I keep mine all in a shoebox. A lot of them are products that I don't want to use, but have no means to throw out. So I wait until I find someone who I know would use them or I've been donating them at xmas time to young girls in families who are less fortunate. Haha, on my... you've definitely got one up on me. I think the key is probably to put out a few sample where you can actually see them. That's what everyone has been suggesting, maybe I ought to try that too, get a little dish out there and just plop a few on my vanity. PS. I still have that PurMinerals primer too...Luxebox from 5mil years ago? oh man, i need to do this. i have samples spilling out of my room. its ridiculous. ps. that MUFE makeup remover is one of my favourites for using on waterproof mascara! Wow you have a lot of samples! I have more skincare ones, not much makeup ones. Good luck! I am doing the same thing with my samples. I have a clear container from the dollar store that I keep them in, and I add a few to my get ready area to use up, then bring in new ones. :) Adore your blog. I am a fellow Canadian as well! oh the samples....I'm always just giving them away to people.Last year I did a whole month where all I would wear was gwp makeup samples, let me say that month was hard. i may have tons of them, but there is a reason I never wear them. I store mine in a container...I use them up while traveling or I devote a time to finish a particular one up.